In the previous essays on collection theory, we learned of “the treble” as the method for gaining exclusive use to a plot of land. I speculated that great amounts of money will be spent in the competition for the best land, whether for estates, industry, retail or nation building. Like today, all of that money belongs to the landlords. Unlike today, we, the people of Earth are those landlords. But how are these profits to be distributed to us, the owners of the land? On the opposite end of the Georgist spectrum are those who claim that all of this rental income belongs to us as a collective and should be spent exclusively on city services, infrastructure, education and anything that is now financed by taxation. Solutions from the right and left are usually fraught with contradictions and terrible consequences and that is no less true amongst Georgists. In the libertarian case, we wonder who will pay for all these vital city services. The libertarians say they will be privatized and all of the people, in light of their dividend from ground rents, will be able to afford those services they desire. But this ignores the reality of locality, economies of scale, division of labor, and most importantly, the priority of human necessity. It doesn’t take much imagination to see the absurdity of 10 different police forces in the same neighborhood, each protecting only their customers. Do they each have their own judiciary? God help us! Or 20 different waste-water services riddling terra firma wherever we go. Of course, the average person will not spend their dividend on city services and community infrastructure, but on their own needs, particularly if they are wanting. It is clear that police and fire protection, utility infrastructure, roads, sidewalks and parks will be very expensive and affordable only by the wealthy. The poor will not be able to afford these services on their own, but can use their dividend to purchase a package of these services by renting land on those large estates where the services are available. Not only do they sacrifice most, if not all, of their share of profits from the ground rents, but must pledge fealty to the landlord at whose pleasure they reside. Thus the best possible outcome from the libertarian solution is a return to feudalism, with the worst possible outcome, the annihilation of mankind, a distinct possibility. That is why most Georgists gravitate to the collectivist solution of expropriating everyone’s ground rent profits for public goods and services. But the problems here are just as severe. The least important problem, at least to those whose bellies are full and homes are warm, is that the very poor must spend their dividend on police that will harass them, streets and schools they will never use, and parks that will evict them at night, instead of food and shelter. To a lesser extent the working poor and lower middle classes will have different priorities for those funds than the city burghers. Don’t assume for a minute that this is no different than today. Today we have a somewhat progressive tax system, correlating use of public services with payment for those services. Collectivist Georgists would have the billionaire pay the same amount for police protection of his myriad properties as the starving homeless person pays to be harassed by the same (and ignored should an actual violent crime be perpetrated against them.) That amount is the ground rent dividend. But this is not a system that works if only we turn a blind eye to the injustice. Far more critical is what constitutes a city, a police district, a county, a school district, a sanitation district, a state, etc. Many Georgists today act as though the current boundaries were ordained by God, rather than part of a dynamic flow. If distributions are per capita, then this is not an issue as distributions are boundary independent, assuming a fixed allocation per capita for each of these services at each level of government. Then we are left only with the injustice, which, at least, is better than the feudalism that results from the libertarian solution. Unfortunately for the collectivists, per capita distribution is only possible if collection is at the federation level. LVT Georgists (the vast majority of Georgists) do not advocate collection of rent at the federation level. If rents are collected locally, they will be distributed locally, regardless of the size of the local population. Rich cities or counties will have many more services than poor cities or counties. People will migrate from poor communities to wealthier ones, causing land value in poor communities to drop even further and increasing the land value in the wealthier communities. It is clear that local rent collection can only result in walled cities and “barbarians” at the gate. So, if we accept rent collection at the federation level, are we stuck with the injustice of per capita distribution for public goods and services? Not if we understand the synthesis of the libertarian and collectivist solutions. If the distribution is restricted to public goods, it fails to fulfill the promise that the Earth belongs to each of us. For many just barely making ends meet, an effective police force, new bridges, environmentally sound water and waste systems, good government, and so on are not high on their list of priorities. To the exclusion of nutritious food and safe shelter, they are negatives. To the exclusion of medical care, they are negatives. To the exclusion of an education where they can earn enough so they might enjoy the finer things of life, they are negatives. Paying $25 of a person’s ground rent distribution for police protection at level 3 of the cellular democracy is effectively a head tax. That is because Donald Trump and the poor woman selling Streetwise on the corner are basically paying the same $25 for police protection. But we need police and fire protection, streets, infrastructure, and good government. Nor is it desirable or just to tax productive labor. The solution is both simple and elegant. 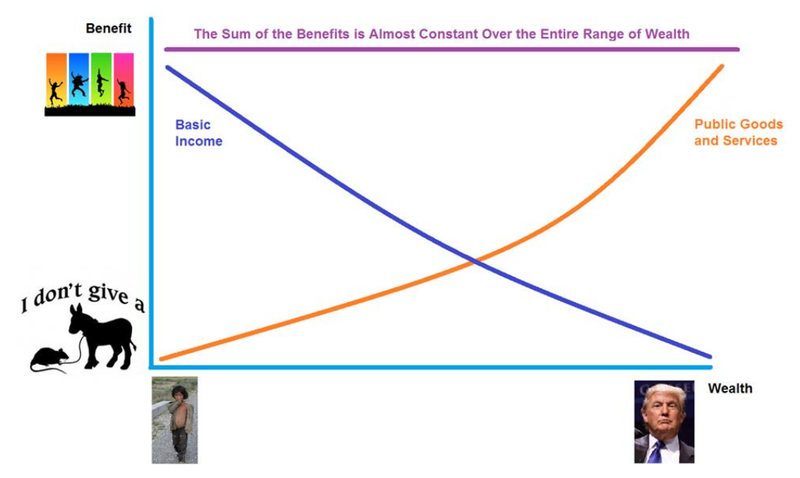 If you graph the benefits received from a public goods head tax versus wealth, and the benefits received from an entitlement versus wealth, the sum of the two graphs, at all levels of wealth and income is approximately equal. Thus, if the ground rents are divided equally between public goods and personal benefits, then equity is achieved in the distribution of the Earth’s bounty. Let’s take a look at the cellular democracy and how one person’s distribution for police protection might be allocated. TP/C can be thought of as the average population of a cell at the given level of federation. Shown is the food distribution at level-0 for sovereign individuals/families and level-4 for citizens of the sovereign state. 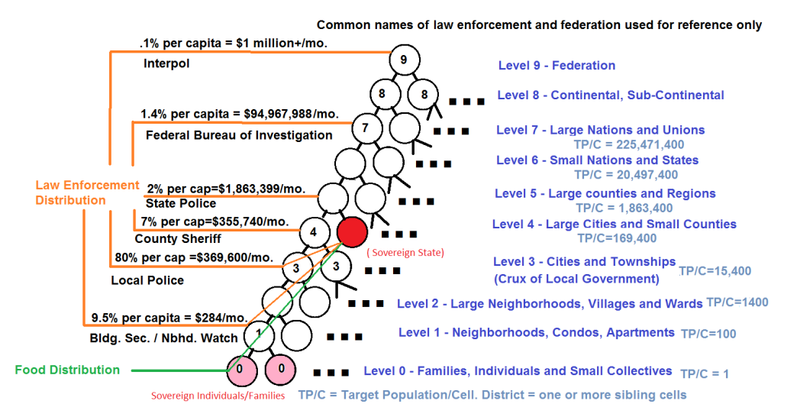 A hypothetical law enforcement distribution is shown at levels 1, 3, 4, 5, 7, and 9 for sovereign individuals/families and 4, 5, 7, and 9 for citizens of the sovereign state in red. An orphaned cell has no parent at the next higher level of federation. It receives the distributions for all missing ancestors. Distribution theory holds that the sum of the distributions at levels 1-9 should equal the distributions at level-0. In the next installment we will continue the study of distribution theory on distribution allocation. In the installment after that, distribution theory study will conclude with a discussion of intellectual property and monetary policy. This article is a part of an ongoing series explaining the AFFEERCE Georgism implementation based on the ideas of economist Henry George. The fruits of our labor belong to us alone while the land belongs to each of us and to all of us. AFFEERCE is an acronym for Alternative Families + Free Enterprise + Universal Entitlement + Balance of the RCs + Enlightenment. To further understand, check out AFFEERCE Volume I – The Vision at AFFEERCE.org. For more info on AFFEERCE natural rights, See AFFEERCE – Volume I – Chapter 8 – The Natural Rights of Mankind. For an introduction to AFFEERCE, See AFFEERCE Volume I – Introduction and AFFEERCE Volume I – Chapter 1 – What is AFFEERCE? See also the stand alone PDF “What is AFFEERCE”a 12 page introduction. All of these are available free on the AFFEERCE website http://AFFEERCE.org. © Text Copyright Jeff Graubart rights reserved. Jeff Graubart is a software engineer and one of the earliest fighters (1970s) for marriage equality. He organized the first conference in 1973 for an LGBT March on Washington. He has spent a lifetime applying principles of logic to ideologies on the left and right. AFFEERCE Georgism is the outcome of that lifetime endeavor. Currently he is working on what he hopes to be the next viral app called NowSeeHere.tv. He plans on using the revenue from NowSeeHere to fund the land trust that will give birth to AFFEERCE Georgism. More information is available at http://AFFEERCE.org.